This entry was posted in Sewer and Drain, Tubs & Showers and tagged bathrooms, bathtubs, DIY, drain clogs on May 7, 2013 by . 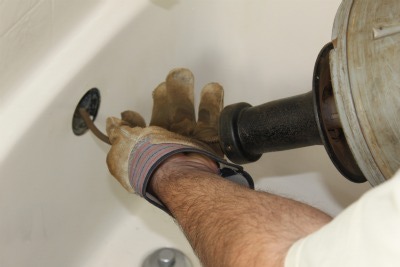 Few household problems are as annoying and occur as regularly as a clogged tub drain. The problem is generally caused by a combination of hair and soap, which combine to make a hairball of nightmarish proportions. So the best way to deal with a clogged drain is to prevent it from happening at all. If you have an old-fashioned rubber plug drain, you can get a little strainer for it. The next thing to do is to notice when the drain becomes sluggish. That’s the precursor to a closer, so get that little hairball monster while it’s small. The procedure for cleaning out the drain is the same when it’s clogged as when it’s sluggish. First, attempt to clean it out with your fingers. Hair doesn’t tend to get very far down the drain before it stops moving, and you might be able to reach it with a screwdriver. After that, try good, old-fashioned Drano. Can’t hurt, might help. If that doesn’t clear out the clog, try Nair (the hair removal cream). Squirt a whole bottle down the drain and let it sit 20 minutes. If none of that works, the next step is to call your trusty plumber service, My Plumber. Don’t mess with an auger or snake if you have a pop-up or lever plug in your tub. There’s too many components and it’s too easy to damage. Let us do the job for you. With over 30 years experience, you can trust us to get the job done right.